consumption. idle. comfort. stiff. inserted. indifference. stares. glares. question. egoes. courage. dodge. defense. conversations. opinions. Call it a treat or the aha moment. Finally an entire railing stretch flanked by women, doing nothing, just looking, hanging out, being themselves. there were just more women occupying the road? all looking back at you? and yet if this were everyday there would be no need for Action Heroes . We were just a group between 20 to 30 people. That evening we saw the nature of the place change, gradually. Jan 28 the following Action Heroes were there to make themselves feel safe comfortable and challenged . For those of you who know Brigade Road, Bangalore- the photos are self explanatory. Paige Trabulsi. Yamini Deen. Soumya Shekhar. Surabhi Kukke. Amrutha Bushan. Archana Srinivasan. Chris. Kunal Ashok. Kathleen. Anusree M Jois. Vivek. Neha. Smita. Naina Bharni. Sanjana Janardhan. Soumita Majumdar. Shalini Mukherjee + x no. participants from the public. Defense is choreographed. It's non verbal and establishes the relationship between looking and power. We defend only when there is a need. It results in the person feeling threatened by a group of women who are doing nothing but just looking back. Usually he slips away. demeanor had completely changed from the earlier gung-ho attitude. something wrong... but he wasn't man enough to admit it i guess. that no one else has a problem with it. Note: our objective is not to 'catch' men, but to intervene in the streets/ to be ourselves/ to reclaim space/ to confront street sexual harassment. What if we were a 100? 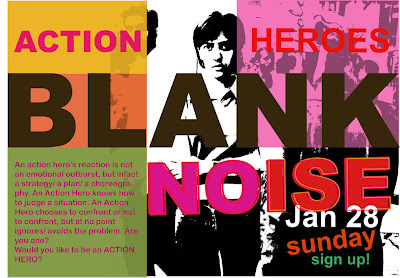 Blank Noise Project Bangalore calls for women/ girls/ ladies/ of all ages, languages, colour, and shape to be participate in a street intervention on Sunday January 28th. 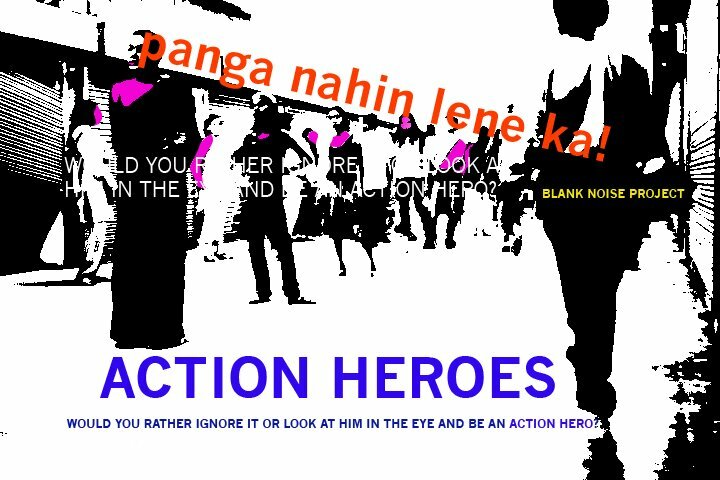 By participating you will be celebrated as a BNP Action Hero. We guarantee that this action won't ask you to be acrobatic, but to be yourself, and experience the site you act upon transform. Be the stimuli, be an action hero. 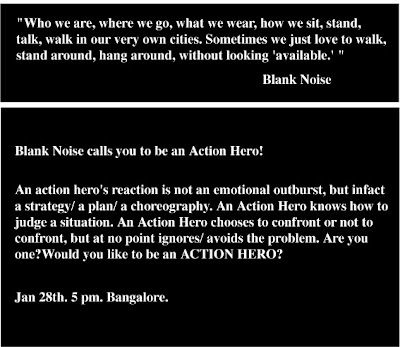 To sign up mail us at blurtblanknoise@gmail.com, subject titled ACTION HERO, BANGALORE. Any one can volunteer to work behind the scenes/ run around and get this going! Last week was handled by Yamini Deen, Soumya Shekhar and also Sanjana. Looking forward to plenty of action! An action hero's reaction is not an emotional outburst, but infact a strategy/ a plan/ a choreography. An Action Hero knows how to judge a situation. An Action Hero chooses to confront or not to confront, but at no point ignores/ avoids the problem. Are you one? Would you like to be an ACTION HERO? 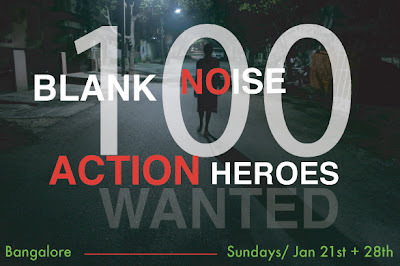 One of the few ways in which you can become one is by participating in the next Blank Noise street intervention scheduled for Jan 21st and Jan 28th both in Bangalore. We will simply be ourselves. We will do a very simple action that will transform the nature of the place for that period of time. We will also challenge ourselves, just a bit. We guarantee you nothing but some more questions to think about, perhaps some insight? Every Action Hero has a different story of acheivement. email us. subject titled 'ACTION HERO' BANGALORE. Can I bring other prospective Action Heroes along? Yes! please bring friends, cousins, neighbours, anyone, any age, any profession, anyone willing to experience. Both men and women are welcome. Most of us have been taught to not look back and to avoid situations rather than confront them. Hence we make ourselves safe on the streets by maintaining eye contact with the footpath and ignoring every passing comment, touch, whistle, pinch....accepting it as a way of life, as something to be expected, accepted and not dealt with. This was a collaboration with JAGORI. 13 Action Heroes were asked to be an alphabet and stand at the traffic signal. Together they formed a sentence, KYA DEKH RAHE HO? In the meantime volunteers ( male and female) from both Jagori and Blank Noise distributed pamphlets to people in traffic. This was my second intervention with Blank Noise. And just like the first one it was empowering to stand in a public space and stare back at men. I thought this intervention was particularly effective in terms of generating curiosity amongst on-lookers and attracting their attention. People actually rolled down their windows to take the leaflets that were being distributed by JAGORI and Blank Noise. In the normal course they would shoo or simply ignore people distributing leaflets. Aggression. Power. Control. Words we have gendered and experience in a gendered world. For being traditionally masculine concepts, the 13 women took them on in their own distinct ways. I, hesitantly, and with a prolific bout of shyness, put on my 'O'. One letter suddenly transformed me into a group member. I rephrase- a team member. Though it accorded me the gall to stand in the middle of the road (I was actually on the edge), it made me feel extremely self-conscious, like never before. Not to be mistaken as something awful, the ability to be self conscious is a rewarding and empowering one, if done in a certain context. Friday night's intervention was that context. It being my first intervention of any kind with Blank Noise, I went in without pre-conceptions and came out with many more questions and a few answered ones. As I mentioned in the post-intervention de-brief, the irony of the night struck me. My ability to stand on a crowded intersection, wearing what I desired, fighting against a system we reinforce everyday- the very system that allots me the (unquestionable) freedom to stand publicly with a shiny red 'O' stuck on my sweat-shirt. But this irony is not defeating, it's actually quite simple, if one sees that what we're asking for is our right to not have to be grateful if we walk out on the street at night in the clothes of our choice, and not get harassed. The air reeked of militancy and aggression- things I am personally not comfortable with. But also present was a sense of purpose. My sense of power came not from the ability to stare back, but from the knowledge that I have right to do so without the threat of retaliation. In all, an interesting experience would be very worth the while to try out in other places. I am not going to talk to about what happened and how people reacted. Will talk about how I felt ? The reason why I participated. I had a funny feeling inside on the way to Saket. This was my first time (had a chance before but was too unsure about attending it). Being K (right in front, i chose it) made me even more nervous ( i tend to get panic attacks for nothing).The first few minutes were scary and I kept on figuring things out but then the feeling of being empowered, empowered to do something as big as this (i mean it) struck me. The feeling was wonderful, standing there with 13 other girls was AMAZING. How often can you look into someone' eye and without saying a word convey a message ? The distribution of testimonials was scary. I could'nt see myself giving them to complete strangers without uttering a word but I did. The best part about the evening was the trip back home. Catching a nice autowala was a surprise. Got down at Suparna's place, I was suppose to cover a short distance for my car. That small walk felt so good, was not holding onto anything, even my sweater. Others who made this event happen- Annie Zaidie, Amit Kendurkar, Kalpana Vishwanath (JAGORI), Sidarth. Apologies for the delay in posting this event. We have been waiting for the visuals to go along with it. ..they say its on its way! If any of you were present there and have photographs or short videos of this event, please send it to us at blurtblanknoise@gmail.com. Thankyou!! Presenting Kya Dekh Rahe Ho? t shirts for autos with rear view mirrors. Get one T for your self and two for your friends!